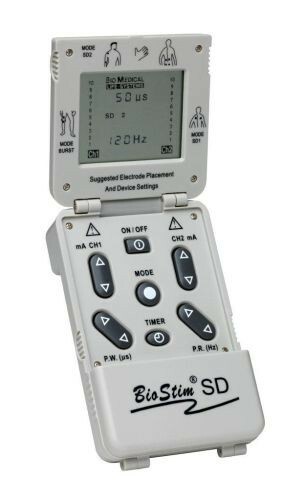 BioStim SD (Strength Duration) is a portable TENS unit that is lightweight, dual-channeled and includes four modes of operation including Strength duration (SDI & SD2). This electro muscle stimulation device allows for clinicians to lock the device in place to ensure that the settings are retained, while the patient can lock the compliance meter and timer, as well. 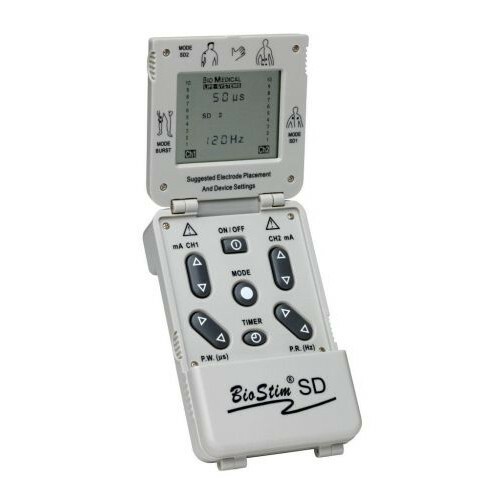 The BioStim SD unit comes with four electrodes, 48 Inch lead wires, two "AA" batteries, a carrying case and a five year warranty to ensure that you receive the optimal experience while using this portable TENS unit. If you're seeking an electro muscle stimulation device that's both gentle and non-intrusive, then give this portable, effective machine a try. You may also be interested in similar electro muscle stimulation devices, such as the Electro Muscle Stimulator EMS Digital with Timer and Carrying Case. Extremely durable, portable and lightweight machine is equipped with a dual-channel TENS unit. Designed with four modes of operation that include Strength duration. Clinician can lock the device in place to ensure the settings are retained, and the patient can also lock and create compliance with the meter and timer. Unit comes with four electrodes, 48 inch lead wires, two "AA" batteries, a carrying case and a five year warranty.